North Park Theological Seminary is accredited by The Commission on Accrediting of the Association of Theological Schools and by the Higher Learning Commission. Learn more about all of North Park University’s accreditations and affiliations. North Park Theological Seminary assesses the educational effectiveness of each degree program. 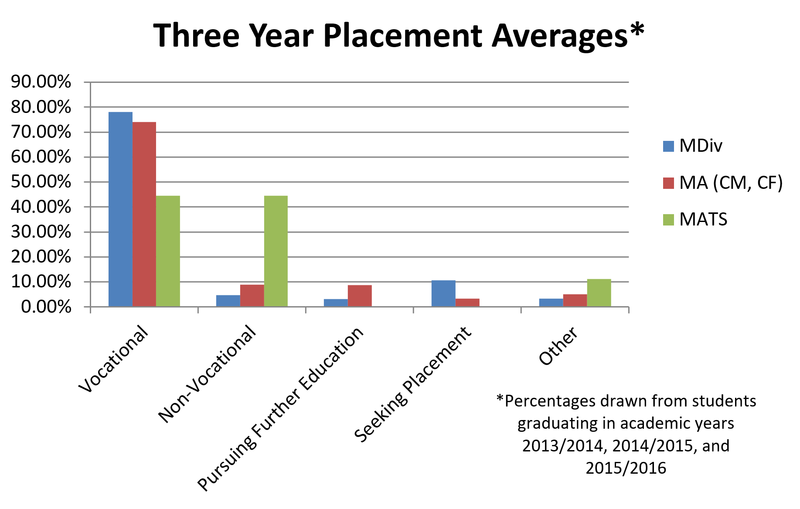 Below are two common indicators of educational effectiveness in higher education: degree completion rates and the placement of graduates. Additionally, North Park assesses the learning outcomes of each degree program using a portfolio system detailed in the seminary academic catalog. Further information is also available upon request to the Academic Dean. Graduation rates are based on enrollment data from six years prior for MDiv and DMin degrees and four years prior for professional and academic MA programs. 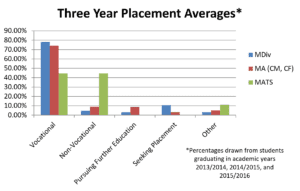 The following is a breakdown by degree program of the three-year average of the percentage of graduated students who found placement since 2013/2014. North Park does not have a mandatory placement program that students must go through, though the school does provide opportunities to connect students to placement opportunities through the Evangelical Covenant Church. DMin students are not recorded in placement data because they are required upon admission to hold a ministry position.